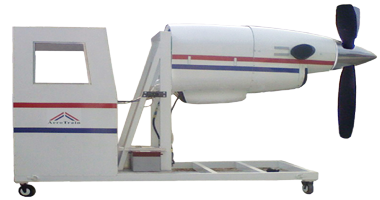 AeroTrain Corp. Model AE-31 provides a cost-effective training resource for hands-on training in any AMT program. The trainer comes complete with an operational turboprop engine. The engine is connected to propeller assembly including spinner and governor.The engine is operated from a semienclosed test cell cabin that has all the necessary instrumentation and controls to run the engine. The engines are mounted with all necessary electrical wiring, engine accessories, controls, and instruments that are needed for running the engine. The students may also be trained to remove and replace parts for field level maintenance practice. A variety of engines are available for Model AE-31. The most popular engine preferred by many training schools in Pratt-Whitney PT6A. The engine trainer may be mounted on wheels for easy mobility. For fixed installations, the trainer is provided with heavy duty vibration and shear mounts to absorb vibrations. The engine trainers are supplied with a comprehensive computer-based training (CBT) that covers the JAR 66 compliant engine construction and operation in an easy-to-understand fashion. The CBT provides the opportunity to the students to learn at their own pace the detailed description of the engine, presented in a learner-friendly manner. The text contents are kept to the minimum while high resolution graphics and animations are maximized. The CBT also provides an easy-to-comprehend description of engine ignition & starting system, engine fuel system, and propeller control system. The visually rich contents are very effective. By using the CBT supplied FREE with the engine trainer, students can come well prepared to the practical sessions, minimizing the time instructor has to spend explaining the concepts in the noisy background during engine operation. The training package also includes wall charts.